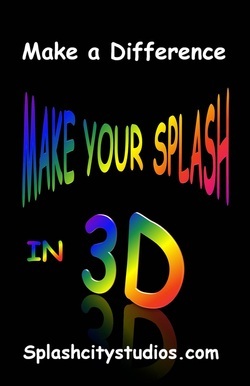 Here In Splash City our 3D characters took their collective power and transformed their city by transforming themselves. Now more than ever before in human history, we need to band together and do the same in our world. People need the skills to cut through the spin rhetoric and miss information, know what is real and more than ever to take control of their world. Most of us are well aware of the plethera of problems our world faces and the daunting task it would be to priortizing this endless list never mind doing something about it. Where does one even begin to make a difference to this world in peril? Here at Splash City we firmly believe the work begins right here at home with ourselves. If we are not adequately equipped to help ourselves then how are we going to be able to help anyone else solve these monumental problems? We believe in Being part of the solution instead of being part of the problem. Become strong in our convictions of who we are as individuals and band together in a united effort for the good of all. A victim has to allow the oppressor to become the oppressor. Now cynacism is reveared as critical thinking. This is one example of 2D linear thinking. In our world we need to do the same thing. Our ultimate vision is to make 2D thinking unfashionable. In a 3D world, This is where dialog would be favored over cynacism, cooperation would be favored over division, decisions pertaining to what's best for all rather that what's best for the privelaged few. 3D thinking is the only way a Democracy can really work, evolve and be sustained.